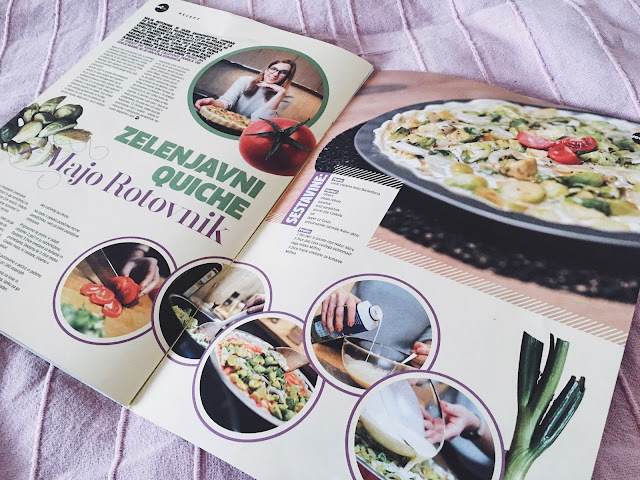 |CUISINE| :: △ VEGETABLE QUICHE & A FIRST FEATURE IN PRINT MEDIA △ | . m i k s t e j p .
x You can play with veggies and use whatever you have at home. I used sprouts - spring onions - fennel - tomatoes - olive oil - salt - pepper - provencal seasoning. First, you start with chopping the veggies. Take the sprouts and cut them into quarters, because we want them into small pieces. Cut onions into rings, fennel and tomatoes on thin slices. Prepare the pie plate and grease it with butter. Next step is to add the dough. After pressing it and shaping the edge, prick it all over with a fork. Don't forget the sides. Now it's time to prepare the veggies. Use the pan to saute onions on the olive oil and a lil bit of butter. Add fennel and sprouts. Saute for two minutes so it start to smell good, than add salt, pepper and provencal seasoning. Now you're done with most of the preparations so you can spread the tomatoes on the dough. The best is to put them as a first layer. Top it with the stir fry veggies. The last act --> prepare the dressing. Mix two eggs with cooking cream and milk. Spread it over the veggies. Ps: It's a great dish for brunch with some salad on the side. Yums. Have a great Sudnay y'all!